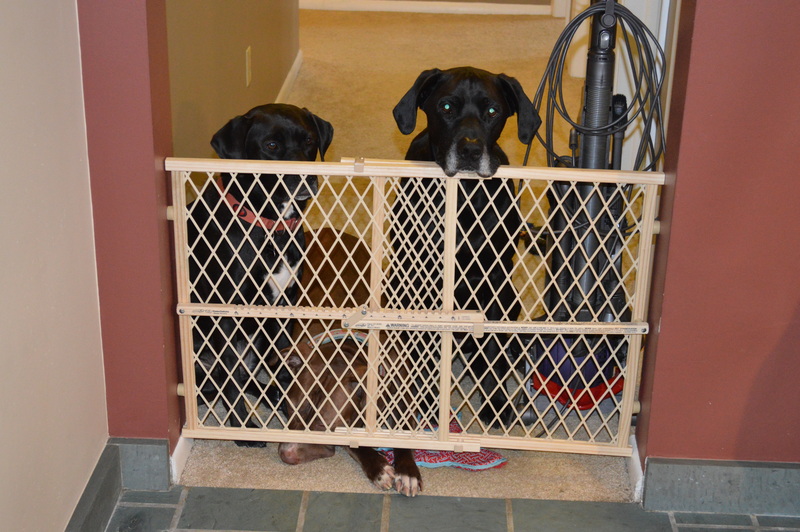 This entry was posted in Wordless Wednesday and tagged Cleaning with dogs, dirty dogs, multiple dog household, Wordless Wednesday. Bookmark the permalink. HAHA! That last photo is great! Luckily, our two don’t shed too much, so a daily Swiffer (we have almost all hardwood) keeps it in check. Our dirtiest area is the kitchen by the backdoor that leads to the yard – we wipe their paws with WetOnes (sensitive formula) before they come in. Our biggest problem area is the couch in the basement – we’re a “furniture allowed” house – our microfiber couch + dog hair = YIKES! But we have a nice vacuum funriture attachment for dog hair and we use a dry-cleaning sponge to spot clean dog drool. 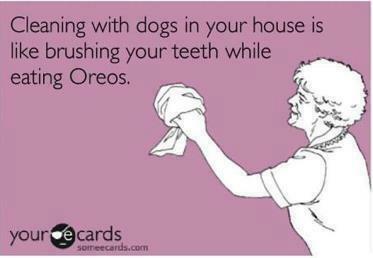 And yes, my BIGGEST issue is motivating myself to clean instead of playing with the pooches! FUR everywhere!!! Now that it is “spring” in NH my dogs are shedding. The shepherd/pit bull mix is worse than my collie/aussie mix which I always find weird…just bought a Dyson DC41 Animal from eBay for $320. Totally worth it!!!! I could vacuum for hours. Is that weird? haha totally agree! 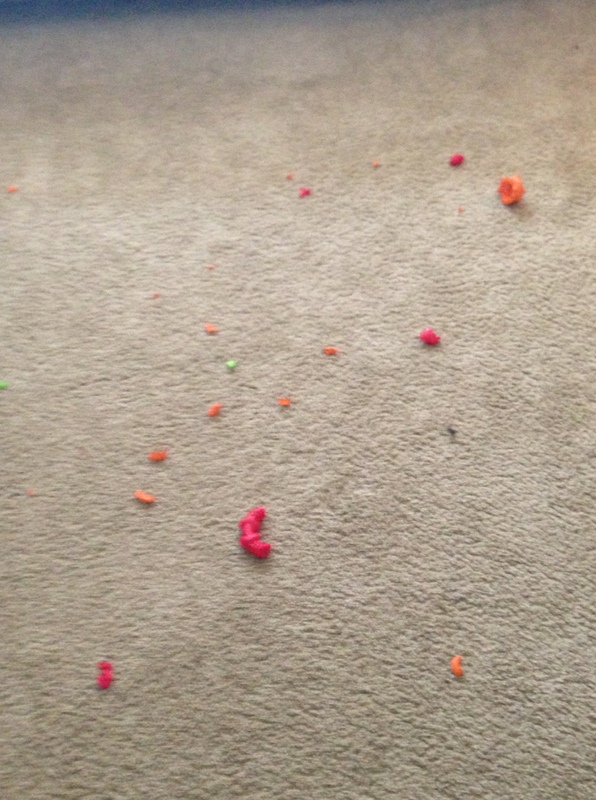 I pick up all of their toys, walk to get the broom, and by the time i’m back, they’ve thrown the toys all over the living room! In the summer, they bring the beach home with them. And these are lake beaches, not the nice sandy shore, so it’s a coarse sand with lots of orange dirt mixed in. I developed an allergy to Hurley last year so I have to say, our house is required to stay pretty clean to help my allergies. Except for right now. It’s not that clean. And yes, it’s definitely the dogs’ fault! I have found it always rains the day after I clean the house so that there are muddy paw prints all over my newly cleaned floors. I got those slippers that buff the floor and i wear them it the kitchen to help with the drinking/water drippage – it’s made a HUGE difference! I know we have lots of pawprints between Boomer and Dottie and I can get them cleaned up but their fur is where I get stuck, it’s everywhere!